Are you ready for the MCM Expo in London this weekend? This weekend is going to be bigger than ever and we suggest that if you have not booked tickets online you try to now as no tickets will be available on the door. MCM London Comic Con gives you the chance to meet stars from both Big and Small screens along games experts and voice artists. The MEMORABILIA area in MCM London Comic Con brings together stars of the Big and Small screen from yester year, so take the chance of meeting some! Offering you the chance to have your photograph taken in a professional photograph studio at the MCM London Comic Con with the stars in attendance, not only that they are printed and returned to you the same day. Bringing you the best dealers from across the UK, Europe and the world, the chance to buy collectibles, Anime, Trading Card, Manga, DVD’s, Games, Comics, Toys and a whole load more. During the MCM London Comic Con you get the chance to play some of the newest games on the market or that are coming to the market. Do you Love online video, Creators, Viewers, Fans, Bloggers, Web Series of all kinds? MCM London Comic Con the UK’s BIGGEST Pop Culture event brings you ‘VidFestUK’, a celebration of all things video and Social. PopAsia is an area within MCM London Comic Con. It offers a of a fusion Japanese & Asian Culture, It allows you to take part and experience many cultural aspects including Music, Food, Fashion, Anime & Manga. MCM London Comic Con and its visitors provide a unique fusion for Comic creators and fans to gather and share in sequential art goodness with those both new and experienced to the medium. MCM London Comic Comic provides a range of support for Cosplayers, we also hold a Masquerade on stage and more! Every May MCM London Comic Con hosts and organises the EuroCosplay Championships, flying in the best Cosplayers from around Europe to become the overall European Champion. The MCM London Comic Con Theatre is where all of the guests take part in talks, the masquerade is held plus presentations and to top it off theres no extra charge. Bringing the past into the future! Throughout the weekend of MCM London Comic Con many activities take place not only inside the show but outside as well, check it out! The MCM London Comic Con Party takes place on the Saturday evening of each MCM London Comic Con. Bringing together attendees and offering them a chance to get together, dance, eat & drink and enjoy themselves into the evening! We will be taking pictures in the event and our owner will be present (with his son) to enjoy the panels and meet Donnie Yen! So enjoy yourself, stay safe and enjoy the fun! The film that sent waves in the Korean box office and all over the world has finally come to the UK. The Korean title 'Goksung' pertains to the rural village where the film is placed, but this village is not like any other... this is the wailing. A guy has stabbed his wife and kids to death for no premeditated reason. Jeon Jong-gu and his police unit get to the area and this is where we see the plot untangle. As more family murders happen suspects emerge and the 'so-called' killers are found to be covered within rashes and boils. Rumors circulate about a middle aged Japanese man who arrived only when these situations occur, this only adds to the confusion and randomness in this violent, scary and suspenseful film. There's nothing more scary about a film that has you fearing something that you cannot see straight away or something that you cannot comprehend. 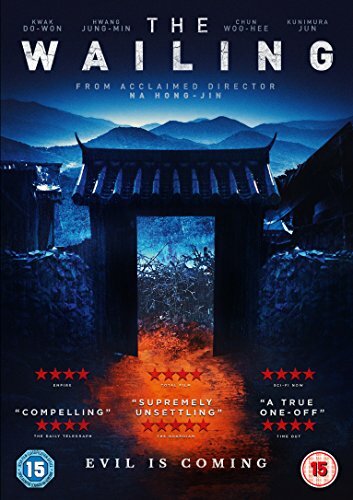 The Wailing makes you want to see what happens next, it starts with a series of gruesome deaths and ends with a plot twist that you have to watch twice just to absorb the true nature of what just happened. The plot, scripted and directed by Hong-jin Na on the surface makes some sense but in its randomness gives the viewer a sense of surrealism making good use of suspense, gore and shock keeping you on the edge of your seat. The director draws upon ancient customs to show a dark, primitive tone where story is first and violence is second. This thriller crosses the line between suspense and horror, associating itself amongst films like The Exorcist, Poltergeist and 28 days later to give you a genre crossing sublime film. The film runs at 2hrs 56minutes long keeping you engaged in the drama and yes the GORE but it does so with such elegance that this has to be the Korean film of the year. This movie is the 8th biggest Korean opening of all time and has the making for being one of the best Korean films to date. It is a fun, thrilling and gory movie that has all depth of a Hollywood movie and all the guts of a indie film. The characters are the focal point of this film and it is a better film for it. As we keep saying, we need to keep Asian film alive in the U.K. and this is an offering that you cannot refuse to watch. Powerful and mesmerising you need to purchase this NOW and watch late at night for full effect. This movie comes highly recommended and is definitely one to watch! GITS trailer 1 is ready for your viewing!